I am kind of the worst when it comes to neglecting my jewelry. Which is probably why I don’t own too many pieces of expensive jewelry. I am fairly good at losing valuable pieces of jewelry, but have managed to get a little better as the years pass. One piece of jewelry I am especially careful with is my wedding ring. I have managed to keep it safe and intact over the past 8 years, but it inevitably gets a little caked with lotion and oils. While I do get it professionally cleaned every 6 months (as part of the warranty on the diamond), it can look pretty dull in between cleanings. Instead of buying a commercial jewelry cleaner, I decided to save myself the expense and make a super easy homemade jewelry cleaner at home! 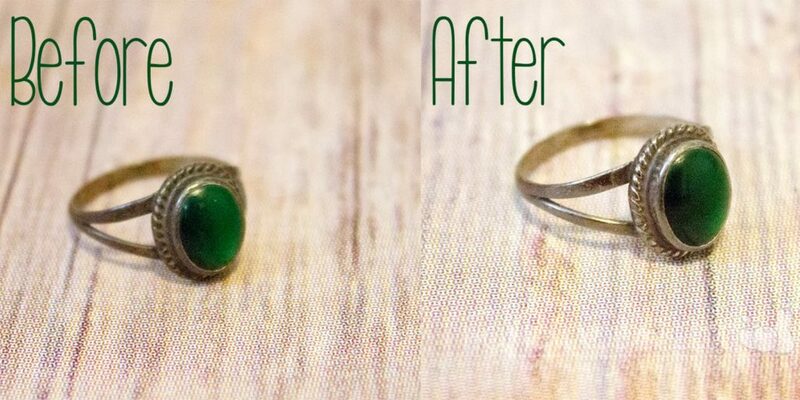 It is actually insanely easy to clean your treasured pieces with a homemade jewelry cleaner, and it only takes two ingredients, both of which are crazy inexpensive. Add hot water and baking soda to a small bowl, and stir. 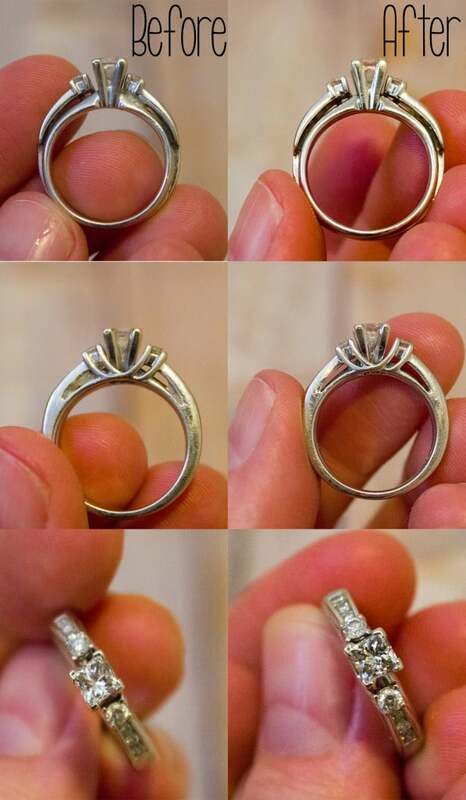 Add pieces of jewelry to the water/baking soda mixture, and allow to sit for several minutes. If there are any crevices, you can use an old toothbrush to remove any debris. Remove, and rub off any spots with a clean towel. You can also double, triple, or quadruple the recipe if you are cleaning larger pieces of jewelry. That’s it! It is super easy to clean your jewelry at home with this homemade jewelry cleaner! *Disclaimer: I have used this homemade jewelry cleaner on my own personal jewelry, and have never had any issues with it damaging precious metals, diamonds or gem stones. I have also heard many people using this method with success. However, if you have a valuable or sentimental piece of jewelry, please see a professional to have it cleaned. As I have not tested this recipe out on every type of jewelry out there, I cannot guarantee that this will not cause damage to your jewelry. Use this recipe at your own risk, as I certainly don’t have enough money to replace it if something goes wrong! Avoid scrubbing your precious jewelry, rather than just let it stay in mixture for couple of minutes and then place them under running water, it will also help in removing dust and debris from the jewelry. I am always amazed at the power of Baking Soda! I never knew you could use it for jewelry too! Thanks for sharing. 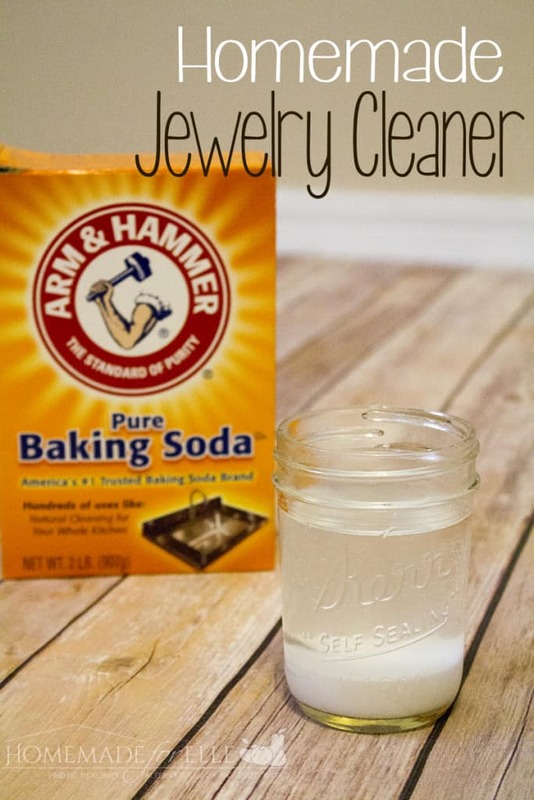 I’ve never made my own jewelry cleaner, but I love cleaning with baking soda. I use baking soda to clean almost everything else in my house. I need to do this with a lot of my jewelry! I love that it doesn’t require special ingredients or harsh chemicals. Thanks so much for sharing!